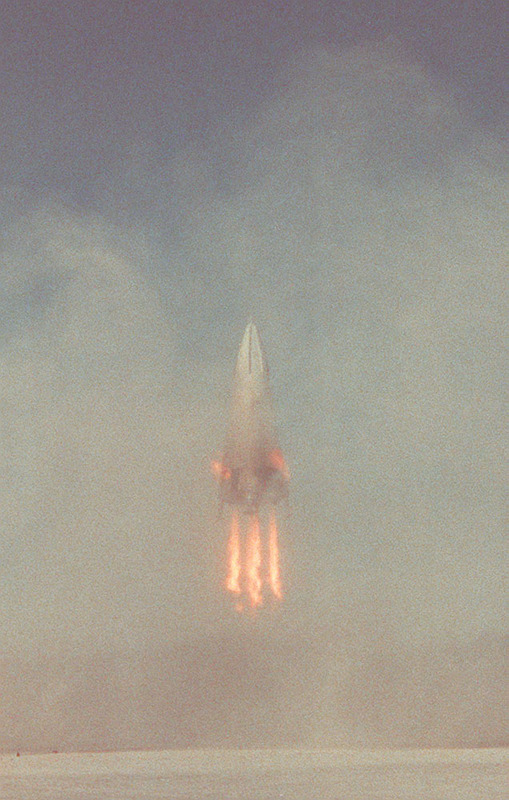 The first landing of the VTVL DC-X Advanced in 1996 (Credits: NASA). In 1997 McDonnell Douglas was the prime contractor in the Delta Clipper-Experimental project, commonly known as DC-X. During the years of 1993-1996, DC-X achieved several successful tests in the quest to become the first single stage to orbit reusable launch vehicle, ascending vertically, moving laterally, and then descending to the ground. Originally a project of the US Department of Defense, in 1996, NASA became the premier sponsor of the project, supporting the vehicle to its highest altitude of 3,140 meters. Its last flight was in July of 1996 when, at the moment of landing, one of the struts failed to deploy and the DC-X was severely damaged. Vertical Take-Off Vertical Landing (VTVL) is a technology that allows a rocket to be made reusable. It consists of taking off from the ground, without a runway, in a vertical position, and landing in the same condition. This is accomplished with the help of a form of propulsion that allows the craft to hover in the air while it lands. SpaceX pursued the goal of the original DC-X through the Grasshopper, which is a 40 meter tall VTVL rocket, consists of a Falcon 9 rocket first stage tank powered by a Merlin 1D engine, and four steel and aluminum legs with hydraulic dampers. Grasshopper tilts just so to return to its launch pad (Credits: SpaceX). 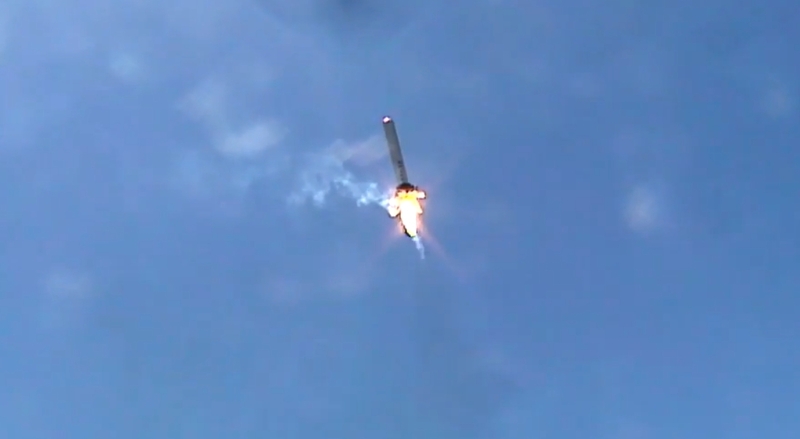 SpaceX first tested the Grasshopper in 2012. Since then has made several flights, carrying it signature life size cowboy figure for scale. The vehicle itself is equivalent in height to a ten-story building, something that can be difficult to realize when watching footage of the test flights from afar. The launches were filmed with the help of cameras mounted in hovering drones. During the first stage of testing, the Grasshopper started with “jumps” of 32 meters; by its final flight on October 7th 2013, SpaceX announced that Grasshopper had reached an altitude of 744 meters with a flight duration of 78.8 seconds. Although this was the last scheduled test for the Grasshopper, it is far from the end of the quest for a reusable rocket. SpaceX is next testing the reusable engines developed under the Grasshopper initiative in the Falcon 9. Grasshopper was never intended to be an operational spaceship. It was just a development tool to get to the real goal: a VTVL Falcon to make the ever-elusive long sought reusable launch system a reality. Elon Musk, CEO & CTO of SpaceX said that with a reusable rocket, launching prices could drop almost 100 times, significantly lowering the cost to place satellites and people in orbit. According to SpaceX’s plan, and a reusable Falcon 9 rocket could be relaunched approximately 24 hours after landing. Ines is from México, has a B.S. in Aeronautical Engineer from the Universidad Autonoma de Nuevo León, she was part of an intern program at Nasa Ames Fluid Mechanics Lab, working on several research projects for 6 months, and now works as a project Engineer and Quality Assurance Manager in Quicksilver Aircraft.